What is a Standard Master Event Template? 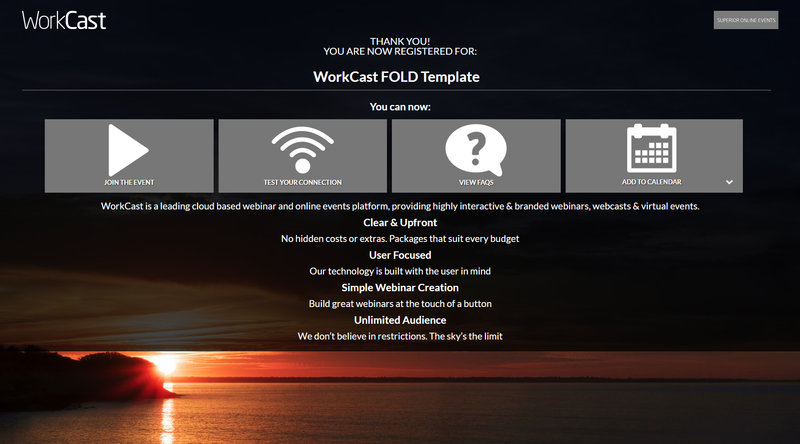 The WorkCast Platform is a unique webinar and webcasting platform that allows users to have fully styled and branded event workflows that can be used for many events. Every WorkCast customer has Standard Master Event Templates in their account. Present+ customers - your account includes 3 standard templates. 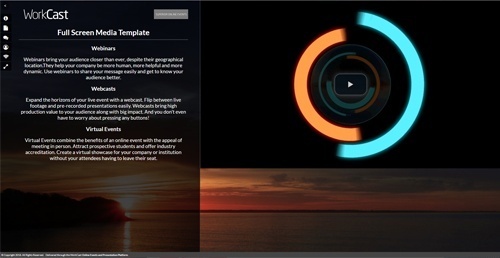 Producer+ customers - your account includes 5 templates, 1 branded to your requirements. The standard registration form is configured with fields which can be set within your template, or amended on an event by event basis. You could also have both options. Fields can be added or removed as you need to. The minimum is email address, but from there you can collect various data you require. It is also possible to provide additional descriptions relating to your event. 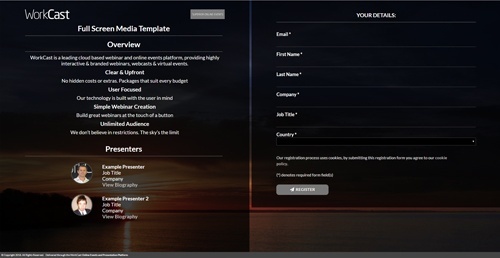 The form will display the presenters, all fields and your overview text/description. A confirmation email is automatically triggered to your registrants and will contain details of the event in an email. The Standard Master Event Template configures 3 reminder emails to be sent to try to encourage attendance at the webinar. One is dispatched 24 hours before the time of the event, 1 dispatched 1 hour prior to the event and the third at the start time of the event. The details, logo and titles are all created automatically so there is no requirement for the organiser of the event to do anything. The live Auditorium is the page that viewers of the webinar access to watch the event. This Auditorium is configured to work across various browsers and device types so your viewers do not need to download any plugins to watch. Social Media sharing options to allow viewers to share the event details (they are optional and can be removed from the template should you need them to). 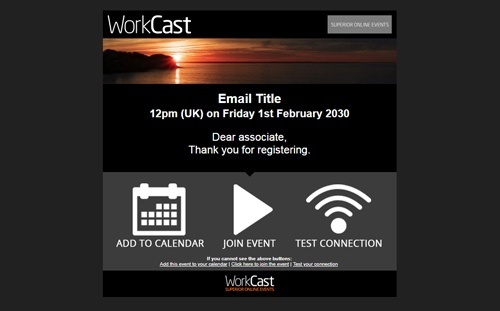 After the event has finished a post event email is automatically created and sent to all registered contacts with a link to the On Demand webinar. This can be scheduled when is best for you. The email will not dispatch however, until the on demand is created and available. 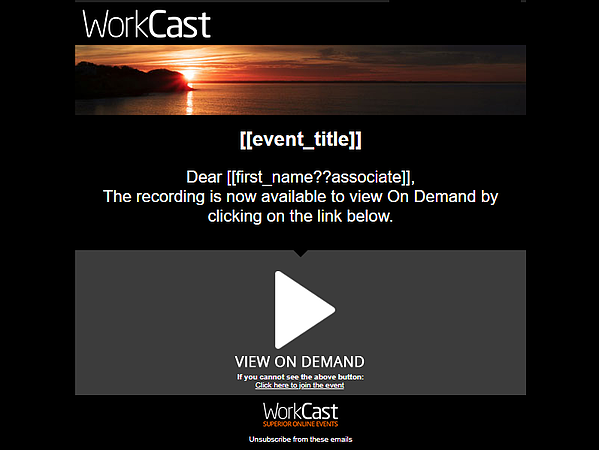 Unlike most platforms, the WorkCast platform automatically publishes a recording of the webinar in the same page as your live event. Once your live event has taken place and the event duration has passed, your event with have a 'Create On Demand' button associated with it. Once published your On Demand appears in the same page URL as your live event.